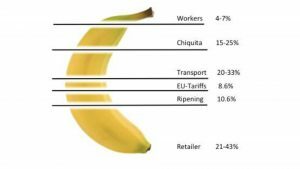 The study examines the banana production operations of Chiquita in the remote region of Changuinola in Panama and contrasts it with experiences from Guatemala and Costa Rica. Of particular interest are the local context and the socio-economic framework conditions in which the company is operating. They are essential to assessing the embeddedness of the company in the region. Moreover, they influence the potential of the enterprise to provide positive sustainability effects through its business activities for the local community, the local economy and the local environment. The study analyses how the use of technology, standards and partnerships can help to mitigate the significant social and ecological problems in the indigenous communities in Panama. It also highlights which areas the Chiquita company would need to address to improve its sustainability and further embed the company in Panama. The main recommendations are deduced from interviews with local experts and workers in the banana plantations. This article highlights the embeddedness of Chiquita’s banana production operations in Panama, Guatemala and Costa Rica. Three studies examined whether the presence of Chiquita in these countries and the extent and quality of embeddedness have generated positive impacts on sustainability such as improved livelihoods for banana workers and the members of the wider community. 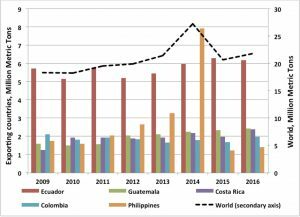 While the paper is focused mainly on Chiquita’s banana production operations in Panama, it is complemented with findings from the Costa Rica and Guatemala studies. Costa Rica and Guatemala are two of the top five banana-producing countries responsible for three-quarters of globally exported bananas. The other three top exporting countries are Ecuador, the Philippines and Colombia (Figure 1). Source: ITC calculations based on UN COMTRADE and ITC statistics. Panama is of particular relevance for the entire banana industry, as the region of Bocas del Toro can be recognised as the historical birthplace of global industrial banana production, which got its start at the end of the 19th century (Abbott 2009). Panama was the first place where banana production was established on an industrial scale and intended for export (Abbott 2009; Lassoudière 2010). For more than 100 years, Chiquita has been the only major banana producer in the country. More than 80 percent of its workers belong to the indigenous group of the Ngobe-Buglé. In Costa Rica, several multinational fruit companies are involved in the banana (export) business today (Chiquita, Dole, Del Monte), and independent producers have usually contracted with the large MNE companies. Chiquita is among the most important ones. It produces bananas on its plantations and also sources bananas from independent producers. The workforce is well educated. In Guatemala, Chiquita is producing only a minor part of the export product on its own farms. The majority is sourced from independent producers or contracted farms. However, in the Entre Rios region, Chiquita is one of the most significant employers. In Guatemala, banana production is characterised by independent producers selling the fruit mainly to multinational companies (notably Chiquita, Dole and Del Monte). Like many other multinational enterprises (MNE) Chiquita is perceived as being exploitative of society and the environment. Therefore, consumers tend to distrust the production of MNE in foreign countries (Aerni 2009). Nonetheless, the socio-economic framework conditions in which a company has to operate need to be taken into account when evaluating its business operations. An MNE that invests in a less developed country is often faced with issues of poverty and lack of (human) capital, infrastructure or technology. Also, these countries often cannot comply with global standards (Aerni, 2009). However, an MNE that produces and invests in a less developed country has the potential to develop positive sustainability effects through empowerment, innovation and entrepreneurship (Juma 2011). Existing studies offer guidance on how businesses and organisations can operate in socially responsible ways but do not provide robust methods to check if positive sustainability effects indeed are generated. Here, we want to show how the embeddedness of Chiquita can lead to positive sustainability results in Panama, Guatemala and Costa Rica. The concept of embeddedness assumes that the stronger the social and economic ties that a company has with its stakeholders, such as its suppliers, customers, non-governmental organisations (NGOs), the government, academia and so on, the more embedded it is. Through embeddedness, an MNE like Chiquita can generate substantial business advantages, facilitate access to resources and improve its local acceptance. This is crucial in banana production, which requires a considerable local labour force. Until the construction of the oil pipeline between the Caribbean and the Pacific coast of Panama in the mid-1980s, no road existed across the Talamanca Mountains. Bocas del Toro was isolated from the rest of the country, and the government had no interest in investing in the region (personal communication, Chito Quintero). For Chiquita, it was therefore instrumental to build the production and export infrastructure in Changuinola from scratch including the port in Almirante, houses, schools, shops, recreation centres and hospitals for its workers. Due to the absence of the state, the company had to provide this infrastructure and services that go beyond its core business to be operational. The firm organises events, hosts sports and cultural activities and, in fact, is delivering a significant amount of services to its workers. Through the years, however, many people have criticised the paternalistic nature of the company. The company believes its approach and support of social issues, in particular, the housing program, is helping Chiquita to move away from a paternalistic scheme and towards empowerment of its employees and their communities. In the 1980s the Panamanian government began to assume some responsibilities such as education and healthcare (personal communication, Luis Nuque). Some governmental departments (environment, agriculture, economy, finance, commerce, health, education, housing) and institutes (human development, sport, art) are now based in the region. Chiquita’s history in Latin America and its relationships with governments are a particularly delicate matter. As a company in the banana business where margins are small, it is faced with the challenge of engaging in corporate social responsibility (CSR) activities. More than 20 years ago Chiquita pioneered environmental and social responsibility in industrial agriculture. The challenge, however, has been to reconcile economic demands to maximise yield with society’s pressure to protect people and the environment, an outcome it is still struggling to meet fully in some regions more than others. The embeddedness of Chiquita, and how it is perceived, has evolved. In the early 20th century, it was strongly embedded in the infrastructural dimension such as through the port in Almirante (Panama). It is similar to the developments in Costa Rica where the goal was to connect the plantations to the export port of Puerto Limón. The railroads in Costa Rica and the infrastructure in Panama transformed both countries, making them accessible and able to contribute to economic development and national wealth. The importance of the national income today is much less in Panama, which is dominated by services. However, in the remote region of Changuinola, Chiquita dominates the local economy. Likewise, banana production is a significant pillar of the Guatemalan economy. In 2013 banana exports accounted for 7.7% of Guatemala’s total exports, making it the third export product after textiles and raw sugar (UN Comtrade 2014). It then increasingly became embedded in the social, economic and environmental dimensions. This has led some to accuse Chiquita of paternalism. The population in Changuinola, according to critics, is “addicted” to the services provided by Chiquita. The company is still paternalistic, offering many benefits. However, all those benefits are negotiated between SITRAIBANA (labour union) and Chiquita, which must comply with the decisions because the government has long forfeited its role as a provider of many of the services. Instead of addressing the causes of poverty, the government is responding to local calls for support by subsidising food and other essential services. Corruption and governmental neglect impact Chiquita’s embeddedness in several ways. One of these is the unrestrained rise of illegal settlements around Chiquita’s plantations where the most vulnerable people are living. While it is not Chiquita’s responsibility to manage illegal settlements, its reputation is negatively affected, and its socio-environmental embeddedness will be perceived as low. Experts, on the other hand, consider Chiquita as a threat to the health of the settlers because of the intensive use of agrochemicals by Chiquita and its future impacts on the illegal settlers and their environment. In Guatemala, Chiquita built two settlements away from the plantations in Nueva Esperanza and Placa for 525 families of workers to keep them at a safe distance from health risks that could result from aerial spraying of pesticides. Unlike in Panama where workers could buy houses, but the government retains ownership, the land on which Chiquita built and sold homes near Entre Ríos in Guatemala was sold to employees for a symbolic amount of GTQ 1 (US$ 0.13) per lot. The houses cost Chiquita GTQ 30,000 – 40,000 (US$ 3900 – 5200) per lot. Between 1990 and 2001, a botched commercial strategy resulted in declining sales for Chiquita bananas. 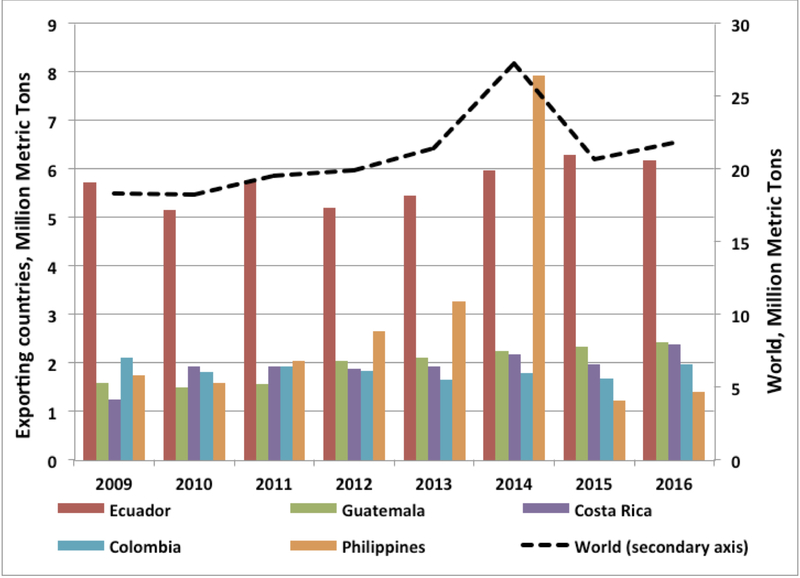 Hurricane Mitch, the emergence of Ecuador as the major banana producer and the introduction of a restrictive import quota system for bananas in the EU (Haig 2003; Wicki and van der Kaaij 2007; Lassoudière 2010) added pressure on the company. In December 2001, Chiquita filed for Chapter 11 reorganisation under the U.S Bankruptcy Code (Chiquita Brands International Inc. 2000; Haig 2003; Wicki and van der Kaaij 2007; Lassoudière 2010). It took some cost-cutting measures, such as selling its plantations in Puerto Armuelles to recover. The negative press coverage tainted the firm’s reputation, while Fairtrade bananas were gaining market share (Wicki and van der Kaaij 2007). In response, Chiquita decided to raise its sustainability credentials by collaborating with Rainforest Alliance in 1992, an NGO focusing on sustainable agriculture (Gonzalez-Perez and McDonough 2006; Wicki and van der Kaaij 2007). The concept of CSR was introduced (Riisgaard 2004; Gonzalez Perez and McDonough 2006) as the Better Banana Project was launched, committing to an innovative environmental approach. After this first alliance, Chiquita made further steps to become environmentally and socially responsible. It resulted in a robust code of conduct and Global GAP and SA 8000 labour standards certifications (Gonzalez Perez and McDonough 2006; Wicki and van der Kaaij 2007). However, the past will continue to haunt Chiquita’s reputation (Haig 2003) if progress is not communicated properly to both internal and external stakeholders. 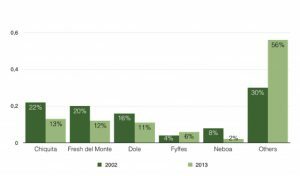 Chiquita, Del Monte and Dole have gradually lost their dominant market share of 65 percent of exports to Fyffes and other companies since the 1980s. In 2002, these MNE controlled 58 percent of exports, dropping to 36 percent of exports in 2013. Of the three major companies (Chiquita, Del Monte and Dole), Chiquita lost the biggest market share over the period between 2002 and 2013 (FAO, 2014). As a consequence, the banana companies bought fewer bananas from independent growers. Concurrently, retailers in the US and Europe opted to purchase bananas directly from producers or wholesalers and bypassed the banana MNE (FAO, 2014). This has been facilitated by attractive logistics and transportation costs. The MNE are now investing less in production, and more in logistics, marketing and distribution networks (FAO, 2014). Harvested while still green, bananas are transported and shipped from plantations to the consumers. 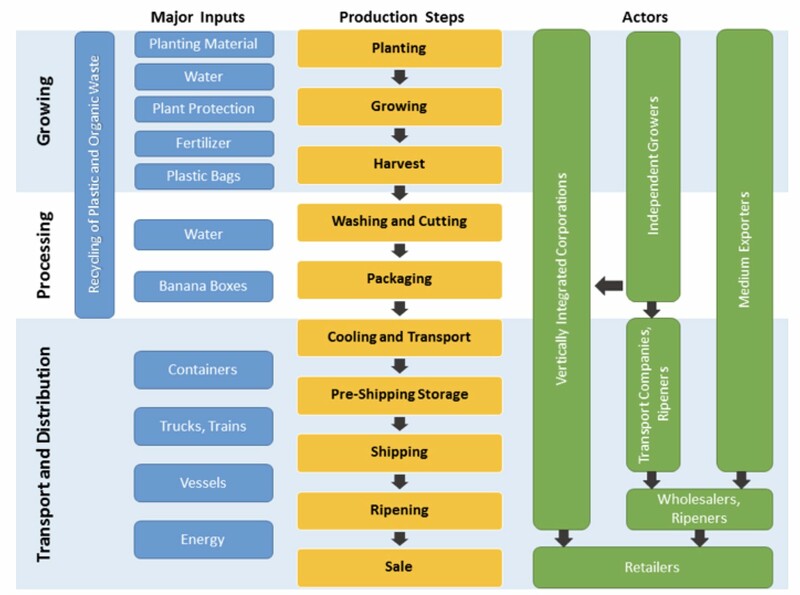 Figure 3 shows the inputs, production steps and actors involved in the growing, processing and logistics. Most of the workforce participates in the growing and treatment stages. A substantial percentage of traded bananas is exported and imported by vertically integrated corporations (e.g. Chiquita) who produce the bananas on their own farms or buy them from independent producers. The production steps are in the centre, illustrated in yellow. On the left, the primary inputs are depicted (blue). The green boxes represent the major players at every step of the production process. Since bananas are produced all year round, the industry offers permanent employment for the local communities. The production is labour intensive, and it is estimated that about one person needs to be employed per hectare. No other agricultural occupation in the tropics has comparable numbers (Baur et al., 2015). As banana production is also very capital intensive and highly sophisticated and requires detailed planning, international trade in bananas is dominated by MNE. 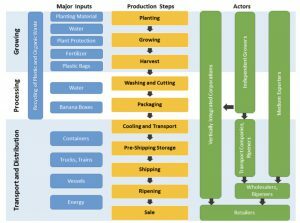 Half of the costs of exported bananas are derived from packaging, shipping and logistics (Baur et al. 2015). 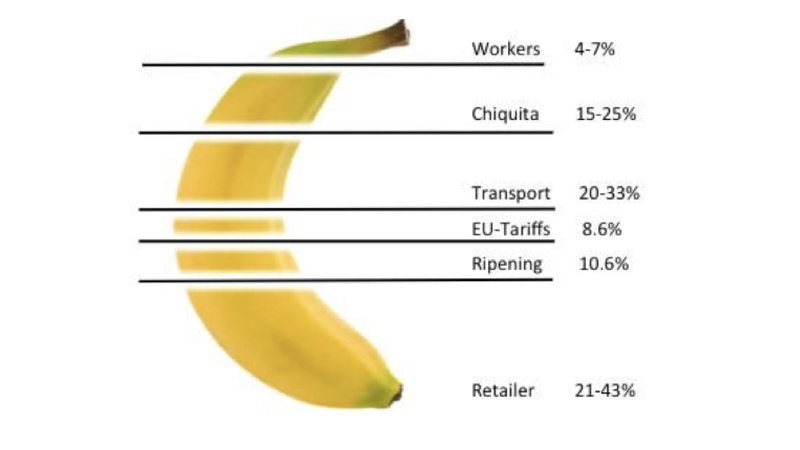 The share of the total value in the banana value chain is split between the workers, Chiquita, transport (logistics), border measures like tariffs and retailers (see Figure 4). The shares differ among the countries of production. Chiquita earns between 15 and 25 percent of the total value. The Swiss supermarket Migros used to get 21 percent of the retail price of bananas (Baur et al. 2015). In absolute numbers, the share of the retailer is even greater for Fairtrade bananas (up to 45 percent) (Baur et al. 2015). Source: Representation by Soldati (2016) based on averages from various literature (BASIC 2014; BASIC 2015; Baur et al. 2015). The data on the embeddedness of Chiquita’s banana production business was collected in Panama, Guatemala and Costa Rica using a mixed-methods approach. The three studies carried out three different surveys: one for the company, one for experts along the local value chain and one for workers. The company survey is designed to capture the extent of embeddedness as seen by the firm. The extent of embeddedness provides information about the relationships between the MNE with different stakeholders such as the local private sector (i.e. suppliers), NGOs, the government, the local communities, research institutions and so on. Furthermore, it captures the involvement (also in financial terms) of the MNE regarding the economy, society and environment, in the local context. The expert survey is designed to understand the perception of local stakeholders about the extent and quality of embeddedness. Experts were asked to name positive externalities and estimate their impact. The quality of embeddedness stands for the expert rating of the involvement of Chiquita in the different dimensions of embeddedness: they include social, economic, technological, environmental, infrastructural, relational, structural and political embeddedness. A comparison of the results of the company and expert surveys helps to find out about perception gaps. For example, the Guatemala study revealed a significant knowledge gap between the business and the Guatemalan population. Many point to inadequate or poorly targeted communication. Some still perceive Chiquita as the company that it was in the 1950s. The worker questionnaire aims to identify the positive impacts that directly and indirectly benefit the workers and their communities. The questions elicit how workers perceive the impact that the operations of Chiquita have on their livelihoods. Below we present findings from the company, experts and workers survey on the different dimensions of embeddedness and the positive sustainability effects as a result of Chiquita’s presence in the region. In the 1990s Chiquita Brands in Panama was facing quality issues, labour disputes with the government of Panama and protectionism from Europe. Today, the relationship between Chiquita and the government of Panama has evolved from the time when the region of Changuinola was isolated with no government services and Panama City was not accessible by road, which was the case until the 1990s (personal communication, Ben Huyghe). Back then, United Fruit Company (UFC), Chiquita’s predecessor, had constructed houses, hospitals, schools and recreation facilities for its employees (Wicki & van der Kaaij 2007; personal communication, Clyde Stephens). For this reason, some assumed that the relationship between the Chiquita and the government was crafted to benefit both parties financially. However, there is no conclusive proof to substantiate these allegations. Given its long presence in Panama, it is not unimaginable that Chiquita enjoyed the particular attention of the national government or indeed profited from its relations with local politicians and local government, some of whom might be associated with incidences of corrupt practices. Despite acknowledging that Chiquita is fighting corruption, respondents to the expert survey believe that Chiquita was to a varying degree complicit in some of the habits practised by the government or its officials. In Panama, Chiquita is expected by respondents to work in a transparent manner with the local government. In Guatemala, Chiquita opted out of partnership projects with the government including a housing project in 2003. Chiquita terminated the collaboration with the Guatemalan government to avoid being implicated in corruption scandals that government officials were accused of. In contrast, Chiquita in Costa Rica operates from a distance and is not directly involved in the country’s policy-making. Respondents believe it is because Costa Rica’s political institutions and legal frameworks are well established and efficient compared to the ones in Guatemala or Panama. For example, Corbana, the official representative of the banana industry in Costa Rica, maintains the relations with the government of Costa Rica for the entire banana industry. The extent of political embeddedness in Panama and Costa Rica are mostly influenced by the strength of institutions and governance. Factors that Chiquita has been faced with in Guatemala’s young democracy with its weak institutions. Guatemala was ranked last in the 2015 democratic development index of Latin American countries (IDD-Lat 2015). The company’s management believes that Chiquita is among a few employers in the country that pay social insurance to permanent as well as part-time employees. Chiquita’s social remunerations are one of the highest by an MNE in Panama. Its employees are the only ones in the region with pensions. Having opposed labour reforms in the past, Chiquita decided it was time to do things differently. Employees were entitled to benefits including privately owned homes. It went on to sign a framework agreement with the global trade union federation on agriculture. To date, it is the only company in the country that has done so. These tangible steps along with a focus on the community have embedded Chiquita in many communities in Latin America (Jaksch 2017). Equality at the workplace is marked by equal pay for men and women for the same job and the opportunity to ascend the management ladder. People with rural and farming backgrounds occupy 85 percent of the supervisory positions. The mandatory social contributions include health insurance, vacation, sick leave and a bonus. Chiquita provides additional benefits such as school materials, sports facilities, union holidays and until recently student transportation, etc. adding up to 23 percent of the total pay. In addition to paying social insurance (12.25 percent of salary) the company invests in nutritious diets for its workers. The nutrition programme also serves the people of Theobroma, a community of settlements mainly inhabited by Panama’s indigenous population (Ngobe Buglé). The programme is implemented in partnership with Deli XL, a Dutch retail company and the government of Panama. Nine local NGOs participate in feeding malnourished children with funding from Chiquita. By funding and prioritising “Target Zero” which is the programme for occupational safety, Chiquita expects to eliminate work-related accidents through training and improvements in the factory environment and the banana farms. It invested in new protection equipment for a value of over US$ 100,000. Chiquita offered land to build schools for the children of its employees and the larger community. It covered school transportation and provided scholarships to the best-performing students. Several programmes were designed to empower women such as the SITRAIBANA women’s committee to build a women’s house and a cafeteria programme was launched to enhance worker nutrition. Women are trained in all aspects of management to run the cafeteria. The company reserved the task of cutting low-hanging leaves in the farms for women. This has been a source of sustainable jobs for the women. The policy raised the number of female employees from seven percent in 2010 to 10 percent in 2015, pushing against a traditional machismo-based society. The empowerment of women can directly impact the education of their children, safety and nutrition of the households. Nevertheless, even if the numbers of women increased, the firm still needs to tackle the collateral problems, such as appropriate sanitation, protection against harassment and nursing facilities. Due to the socio-cultural dynamics, the MNE alone cannot eliminate the complex issue of discrimination against women. Despite the large numbers of women working in banana production, few women hold supervisory positions. Gender inequality is higher among the indigenous groups. Government health experts detected a disproportionally high manifestation of diseases in Changuinola compared to other districts in Panama. Experts blame the concoction of agrochemicals widely used by Chiquita in the region as the cause these diseases, which include cancer, leukaemia, skin pigmentation, birth malformation and low levels of cholinesterase. Experts were split on the severe consequences of the chemicals on sterility, while others do not consider it a problem at all. There are no statistics to confirm the claims or establish the magnitude of the problem. Although cancer cases are prevalent, local doctors are not always able to identify the symptoms on time for treatment. There is no oncologist in the region to help patients and to keep medical data on record. Chiquita does offer medical examinations to workers who handle nematicides. These workers undergo a cholinesterase test every year. If doctors find abnormal values, workers are reassigned to other tasks. Due to the adoption of additional precautions, Costa Rica’s workers have experienced a reduced number of work accidents. They have better and quicker access to medical care, lower exposure to pesticides, improved health and security for workers as well as the members of local communities. As a result, operational costs of the MNE are reduced. In Guatemala, workplace safety improved from the year 2000 following the introduction of SA8000 standards and Rainforest Alliance certification. Workers began using personal protection equipment, which significantly reduced workplace accidents. Those who suffer severe injuries or illness are transferred to public health service centres for further treatment. Workers say the quality of healthcare provided by public health services is poor and not reflective of the 13% public health insurance that employees are paying. They believe that the public health insurance system is in a deep crisis because of widespread corruption. In June 2003, Chiquita sold its banana business in Puerto Armuelles (Western Panama) to the worker-owned cooperative COOSEMUPAR. Notwithstanding guaranteeing market access for the cooperative by signing a ten-year contract to buy the fruit at market prices (Chiquita Brands International 2002), the effects of Chiquita pulling out of Puerto Armuelles revealed just how valuable the company’s embedded operations had been in sustaining the social and economic stability of the town and its banana-growing community. The population of Armuelles dropped to 20,000 inhabitants in 2010 from 50,000 in 2003 (livinginpanama.com). Today in Changuinola, Chiquita’s workers have more money to spend on nutritious food. Families are spending on average between 60–75 percent of their income on food. Nevertheless, some workers worry from time to time about not having enough food. Workers complain about the lack of drugs, doctors and the long waiting time to be treated. Patients are forced to travel to the nearest town of David or Panama City in search of treatment. For many, it is a very costly endeavour. Common ailments include lower back pain, shoulder pain, headaches and exhaustion. Curiously many workers are not aware of Chiquita’s “Target Zero” programme, or have heard about the programme but could not say what it concerns. Field workers who have had accidents at work tend to believe that the social insurance they get compensated for on-the-job accidents. Workers in Panama, unlike their counterparts in Costa Rica and Guatemala, were cautious about offering information regarding the nature of their jobs and their company. They are fearful of a backlash and the real threat of losing their handsome benefits or even their jobs (Rossi, 2013). Both experts and workers say Chiquita performed best in reducing inequality in their communities. Employees in Panama do not expect Chiquita to take over responsibility for the education of their children. It is considered the responsibility of the government or the responsibility of parents. But in reality Chiquita provides school packages to pupils in Guatemala and Costa Rica and scholarships in Panama, Honduras and Costa Rica. Parents appreciate the scholarships that Chiquita offers to their children. Most children go to primary schools located between 10 to 20 minutes’ walk. Chiquita spends about US$ 50,000 per year subsidising transportation for workers. The government of Panama is expected to pass a resolution to use special buses to replace the makeshift tractors and wagons currently used with a safer mode of transportation for the employees. Experts in Costa Rica affirmed Chiquita’s support for schools. The company also provides loans to pupils in the country with an outstanding scholastic performance to help them access higher education. In Guatemala, schools that had been run by the company and provided free schooling for the children of the employees were transferred to the government, but Chiquita still provides school utilities (electricity and water and uniforms to pupils. This transfer of responsibility to the government was met with concern, as many feared the standards would drop if Chiquita were to stop providing the necessary support to the schools. In Guatemala, experts from the business (private) sector perceived the extent and quality of Chiquita’s social embeddedness to be lower than experts from government and NGO institutions. One point of consensus among the experts is that transferring its schools to the government will be detrimental to the high quality and free education that children have enjoyed in the past. The other area of consensus among Guatemalan experts is that Chiquita is more committed to social issues compared to its competitors such as Dole or Del Monte. For example, one direct competitor also runs private schools but with one difference. Access is limited to the children of administrative personnel and not to the children of workers. In Guatemala, Chiquita was also rated better than the other MNE with regard to labour rights. Some workers in Panama point to discrimination of indigenous people and women who are paid less for doing the same job. While Chiquita has hired more women, there is a lack of representation of indigenous people and women in supervisory positions. In Costa Rica, the expert survey shows that Chiquita has reached a high quality of social embeddedness. The studies confirm the fact that as of 2011, Chiquita remains the only MNE to have signed a regional framework agreement with banana workers unions (Jacks 2017, BananaLink 2017). Chiquita pays salaries that are above the minimum wage level. Nationally, the minimum wage is US$ 336 a month, while an average worker’s salary is US$ 461. Including social benefits, it adds up to US$ 700 per month. Although the wages conform to the legal requirements, some families still struggle to make ends meet. The widespread presence of polygamy and consequences of alcohol abuse are two factors contributing to poverty. Men from the Ngobe-Buglé indigenous group often have several wives and many children with each one. In addition, they oppose female employment. Therefore, large families depend on a single wage earner, which is not sufficient to cover all the needs of the household (Baur et al. 2015). Alcohol abuse is common among all ethnic groups but especially prevalent in the indigenous ones. It further diminishes the money available for the household. Some Chiquita workers feel that the salary they are getting is not enough. These workers say they are unable to save despite earning the highest wages in the country and the region. Younger workers are less critical, however, probably because they tend to have smaller families, and therefore fewer dependents compared to older workers who on average have six dependents. Some workers say they sometimes end up working longer than the legal 48 hours a week. Because of the long hours, workers are not able to complement their income through other activities. The majority of employees are union members of SITRAIBANA, an independent workers union that is striving to raise worker salaries, encourage more social programmes and defend their legal rights. Chiquita’s presence is driving the economic development of the region of Changuinola. The company believes its efforts to reduce corruption are necessary to generate trust and to acquire legitimacy at the local level. All the stakeholders and experts affirm that the presence of Chiquita in Changuinola has a positive sustainability impact on the local and regional economy. There is also a consensus among experts that Chiquita drives the economy of the district of Changuinola. For a few experts, however, the company could do more to support programmes for local entrepreneurship development. This is where experts in Panama are divided on their assessment of the extent of the positive sustainability effects of Chiquita on the local economy. While they believe that Chiquita’s presence is the best thing that could have happened to Changuinola, a few think Chiquita has in some instances hindered opportunities to diversify the economy in the region. The latter group points to the exclusive rights that the company has to use the port of Almirante and the associated infrastructure, as this keeps out potential competitors and blocks the economic diversification and development of the region. They think that companies would avoid investing in the province of Bocas del Toro because they will either have to build a new harbour or forge a deal with Chiquita. For many businesses, negotiating a deal with Chiquita is a non-starter. Nearly all commerce and transport logistics in the region are tied to the company and its subsidiaries. Chiquita is firmly embedded, and many agree that the economic future of Changuinola depends on the fate of Chiquita. The majority of experts in Guatemala consider the Chiquita-owned port of Puerto Barrios as critical infrastructure responsible for much of the positive sustainability effects. It is being used to trade many products other than Chiquita bananas. For many local businesses, the port is what enables them to access global markets. In Costa Rica, Chiquita and its employees attracted suppliers and new companies and increased the demand for goods and services. It triggered economic development and entrepreneurship. The continued presence of Chiquita in the country is sustaining the job security and economic prosperity of the local communities. Long-term contracts with local suppliers are expected to improve MNE-supplier collaboration through the adoption of quality requirements and standards. Long-term partnerships increase business security and create trust between the suppliers and Chiquita (temporal embeddedness). Given Chiquita’s commitment to CSR and sustainability standards, this leads to the adoption of more sustainable production practices and helps mitigate negative impacts on the environment and human health. Chiquita invests in promoting environmental awareness. Local farmers and workers receive training on land conservation, management of wetlands and the sustainable use of natural resources. With the German retailer REWE and APROTENGB, radio programmes were created to inform the local population and discuss environmental issues in Spanish and the Ngobe dialect in Panama. Chiquita’s newly built drainage systems in the farms should limit agrochemicals from contaminating the soil and environment. Other conservation and efficiency measures include renovation of packing stations, cutting down on water use and boosting its recycling efforts. The company has been battling nematodes with nematicides. These products contain toxic compounds that are harmful to humans and the environment. Chiquita spent many years trying to find a simple solution to fight nematodes. However, as of yet, there is no environmentally sustainable replacement. But, by injecting the nematicide inside the banana trunk instead of spreading it in granulated form, the company has reduced its negative impacts and exposure to workers, the soil and the environment by 40 percent between 2006 and 2010. Employees that perform pesticide injections get shorter working hours as a health and safety measure to minimise exposure to pesticides compared to other activities such as harvesting. Two decades ago, workers fumigated the plantations against Black Sigatoka every fortnight. Now that the Black Sigatoka has developed resistance, a stronger and more effective fungicide is used every week. The chemical industry has yet to develop a sustainable alternative. So far, there is little commercial interest to develop an alternative product to fight Black Sigatoka. The company’s water treatment plants improve the quality and efficient use of water and also limit the spreading of agrochemicals into the environment. Still, untreated water flows into the rivers because of the limited capacity of the drainage system. The World Bank, according to the survey respondents, had formally recommended building an efficient water treatment facility and has yet to hear from Chiquita. Despite improvements in the quality of water, NGOs and government experts continue to warn against the increasingly polluted rivers and rising fish mortality rate. The small improvements are deceptive. People unknowingly bathe in rivers that are detrimental to their health. IDIAP, an agricultural research institute (Instituto de Investigación Agropecuaria de Panamá), affirms that the continued intense use of agrochemicals will lead to increased resistance towards the chemicals. An outbreak of a resistant nematicide will threaten the company’s future and would put an end to thousands of independent growers and smallholders who depend on plantain production for their food security and livelihoods. Experts are also unanimous on the need to stop domestic waste: there is no disposal or incineration plant in Changuinola, just a large open dump. Chiquita improved its waste disposal system. Plastic is collected and transported across the border to Costa Rica for recycling. Organic waste is disposed of in specially dug trenches. Most experts including AAMVECONA, a local NGO protecting the San San Pond wetland, and the department of the environment are aware of Chiquita’s support for wetland protection, but most cannot explain its involvement. Stakeholders are not aware of any climate change mitigation measures that Chiquita is spearheading or has adopted locally. Employees attend several environmental awareness training sessions every year, but some doubt the effectiveness of the mostly theoretical training. Workers express concern about the continuous aerial spraying of the plantations and its impacts on the numbers and diversity of animal species in the region. In Costa Rica, experts regarded Chiquita as having strong environmental embeddedness compared to its competitors. The project Nogal with its strong local community involvement is assisting in the reforestation and conserving the biodiversity of the area. The beneficiaries include the wildlife refuge of Nogal and the much bigger Mesoamerican Biological Corridor allowing animal migration. Due to the Nogal project, workers have a positive perception of Chiquita’s efforts to foster biodiversity and experts rate those efforts to be an outstanding contribution to environmental protection. Experts considered Chiquita to be the strictest company regarding the efficient use of pesticides compared to Dole and Del Monte. The environmental challenges are similar in the three countries for all the companies. In Guatemala, the consensus among experts is that Chiquita has improved its environmental policy since the 1990s, the main improvement being its pesticide management and the reduced use of toxic products. Also, the decrease in the use of water and investment in wastewater treatment are among the positive developments. Still, most experts rated the company’s overall impact on the environment negatively. Chiquita’s environmental performance is perceived and rated as similar to the other banana producers. No local innovation is currently taking place in Panama regarding bananas. Knowledge is transferred from San Jose, Costa Rica, where the company’s department for research and development (R&D) is located to Bocas Fruit Company (BoFco), which is Chiquita’s local subsidiary in Panama. There is no collaboration with the local universities and therefore no technology transfer is taking place. At least one university has a programme on bananas. However, it is situated four hours’ drive away from Changuinola in the town of Chiriquí (Western Panama, at the border to Costa Rica). The company does not share its production-related information with researchers, nor does it involve or encourage local students to undertake research. Experts agree that Chiquita is weak on the transfer of technology. Their assertions are based on the notion that the company does not share its R&D findings. It declined to collaborate with the local agricultural college and IDIAP. COOBANA, on the other hand, is working with the local agricultural college to train workers and farmers from the region. It is perceived that Chiquita’s focus is more on business while IDIAP is more motivated to increase and disseminate knowledge. Only bilateral and international cooperation would facilitate pest control at the transnational level. By joining the World Banana Forum, Chiquita is demonstrating its commitment to controlling pests in a sustainable way. At the same time, many experts remain sceptical as to whether the company will “fully collaborate with its direct competitors” to find joint solutions. With the knowledge that Chiquita employees have acquired while working on the company’s plantations, experts believe that workers could use this knowledge to grow bananas in their private plots successfully. By making use of bioscience technology, the company could curtail the use of toxic agrochemicals and could improve plant disease resistance, increase productivity, enhance nutritional content and improve other plant characteristics. However, uncertainty and strong-minded NGO opposition to genetically modified food may be holding back the technology. Yet, biotechnology has evolved to a platform technology offering many more possibilities (i.e. gene editing) than just the introduction of foreign genes. The company has no answer to the largest threat to the entire banana industry, Panama disease. It is a soil fusarium that has developed a new strain “Tropical Race 4 – TR4”. In the last century, this disease already wiped out large banana plantations in Central America. TR4 cannot be controlled with pesticides. The only way is by using a new banana variety that is immune to the fusarium, which can endure in soil for decades. For the development of such a variety, however, biotechnological methods (including, i.e. gene editing) hold the most promise for delivering results in the not too distant future. In Costa Rica, the application of pesticides is based on disease pressure monitoring and on empirical thresholds. It has led to the efficient use of less toxic substances. Spraying is better targeted using aeroplanes that are equipped with GPS technology. The application of precision farming techniques has reduced the use of fertilizers and improved soil fertility. The consensus among experts in Guatemala is that the company puts plenty of effort into developing new technologies and production techniques to reduce water use and into precision farming. Chiquita, according to experts, has brought new technologies into the country that have been adopted by other producers. Regarding climate change mitigation and adaptation, the majority of experts think there is considerable scope for Chiquita to do more. Over the past decades, Chiquita has been handing over various infrastructures to the government of Panama that it had built up and operated for many years. They include schools, hospitals and housing. Three years ago, the government took over the provision of water and electricity. Despite handing over these facilities, the company is still investing US$ 5.5 million every year to provide water to nine communities and a monthly subsidy of only US$ 4 per month for water. Also, US$ 9.6 million per year is spent to provide power to the community. Workers get an allowance of US$ 7 per month per worker for electricity. Moreover, workers get free transportation, which costs the company over US$ 300,000 a year. The company has exclusive rights over the harbour of Almirante and two landing strips for aerial spraying for Sigatoka control and a hangar at the Changuinola airport for its company airplane. Although Chiquita built the schools, harbour, roads, etc., the infrastructure dimension received the lowest rating, perhaps because many of the structures date back many years and people do not remember who originally constructed them. Instead, inhabitants of Changuinola complain about the poor maintenance and neglect. In the past, Chiquita shared its machines with the communities in times of emergency. During the 1991 earthquake, the company helped rebuild houses and schools. It supported the Red Cross and firefighters with equipment and personnel. Increasingly, employees in Panama think the houses are not worth buying, as they are old, broken down and in need of maintenance. Also, workers who bought those houses have no rights on the land that their homes are built on. Such land still belongs to the government of Panama. This is an important hurdle; workers who require bank loans are not able to get them because banks require land as collateral. In Costa Rica, Chiquita sold its houses at affordable prices to its workers including the property rights for the land. Homeownership is believed by both experts and employees to enhance the independence, bargaining power and social status of employees. It helps to foster community development and quality of life. For some owning a house means additional costs for them. They expect Chiquita to meet some of the housing-related expenses. Also in Guatemala, Chiquita moved away from giving houses to employees and towards supporting homeownership – an act welcomed by the majority of experts as the best way to foster employees’ empowerment and independence. The presence of Chiquita is essential for the development of the local economy and its workers’ welfare and security. On economic embeddedness, experts in the three countries perceive the firm as important for the existing and future local businesses. It could also be a primary agent for the diversification of the local economy in a place like Changuinola (Panama) where the company could attract more local suppliers if it opened access to the port to other businesses. The comparison of the extent and quality of embeddedness and positive sustainability effects (PSE) shows that they follow the same pattern. The greater the extent and quality of embeddedness, the stronger the positive externality effects. These would confirm the central hypothesis that the extent and quality of embeddedness are related to the level of sustainability impacts of the company’s operations. The framework conditions in the three countries have determined the number of challenges faced by the firm. With its labour laws and low level of corruption, Costa Rica is the most developed of the three countries. It has the highest level of education, excellent medical care and policies for inclusive growth of the economy. The international NGO community and western consumers’ outcry and demand for sustainable production practices led to Chiquita’s commitment to CSR principles. On the other hand, these same groups hinder the choices that Chiquita could undertake to vastly reduce the use of pesticides and aerial spraying, and consequently improve the environment and livelihoods of the workers and their communities by seriously considering biotech solutions to mitigate negative impacts on the environment and people. These findings are significant because they suggest that stakeholders and experts are well aware just how dependent their regions are on Chiquita, and how they will be economically worse off without the banana industry. Many are concerned about the impacts of new and emerging threats to banana production. The new strain of Panama disease, Tropical Race 4 (TR4), and climate change can potentially wipe out the banana industry in their regions if a new immune variety is not found in due time. The threat that an exogenous shock wipes out Chiquita and the whole banana industry is increasingly more real since the first Panama disease. Chiquita’s technological embeddedness is weakest in Panama compared to the other two regions. The company is extremely hermetic and does not share its technology or innovations with local institutions. In contrast, it is over-embedded in the infrastructure dimension by not letting other companies access the Almirante port. In some instances, the company still has exclusive rights to use the infrastructure that it builds. While the extent and quality of embeddedness determine the sustainability impacts of the enterprise, we see that the environmental dimension of embeddedness follows different patterns. The environmental embeddedness can be high but with a weak score on sustainability effects. It is partly due to the persistent perception that industrial banana production is harmful to the environment. Unless accompanied by targeted communication and awareness programmes, efforts to strengthen the extent and quality of environmental embeddedness alone will not rid the negative perceptions held by those beyond the industry’s primary stakeholders. Even though experts recognise the efforts of the MNE to reduce its environmental impact, they believe there is room to improve its embeddedness by improving the quality of its programmes. Experts perceive that many programmes look good on paper, but are often poorly implemented. Chiquita is a vertically integrated company. It controls the value chain from production and shipping to ripening. The overall conclusion from the engagement of Chiquita in the three countries, Panama, Costa Rica and Guatemala, is that the company is embedded in the local communities where it operates. The company recognises that embeddedness is crucial to ensure the morale, commitment and productivity of Chiquita’s workforce. The combination of the MNE’s commitment towards its workers and local institutions has provided good access to health care and education. Also, positive effects resulting from Chiquita’s embeddedness were mainly found in the local economy where the company created a vast number of local jobs in banana production, processing and transport including in Guatemala. Experts note that Chiquita pays fair salaries, which translates into decent economic conditions with security for workers. Nevertheless, workers perceive that their wages are decreasing relative to the quickly increasing costs of living. Chiquita’s association with independent banana producers, which has been the case in Guatemala and Costa Rica, facilitates the transfer of knowledge to the local economy. The company imposes strict quality requirements on its suppliers and demands full compliance with the Rainforest Alliance (RFA) standard. The role of international retailers on Chiquita’s drive for quality and its long-term strategy cannot be underestimated. The retailers demand for sustainable banana production made the banana industry one of the first to incorporate “voluntary” sustainability standards. Chiquita has been leading the industry in that respect. In Costa Rica, the MNE contributes to the adoption of sustainable production practices and entrepreneurship. Nevertheless, the survey on the perception gaps shows that Chiquita’s efforts are not well acknowledged. Likewise, the MNE’s contributions to the generation of positive sustainability effects are barely known. Besides having positive impacts on the communities, Chiquita benefits from or even depends on its embedded activities around the plantations. These allow the company to continue producing in remote areas where there is a lack of public infrastructure and institutions. Way out of paternalism: There is a need to find a balance between embeddedness and paternalism. Chiquita’s embeddedness should focus on strengthening its core business. Currently, its social commitment focuses more on giving endowments for workers. Instead, the company could encourage public-private or private-private partnership and business models that include workers to avoid accusations of paternalistic behaviour. For example, Chiquita could work with SITRAIBANA to stop subsidising workers for infrastructure expenses and instead increase wages. Local actors in the three countries tend to focus on negative effects rather than on positive sustainability impacts generated by Chiquita. To rectify some of the distorted perceptions about Chiquita (“solve the perception gap”) and to improve the reputation of the company, communications within the three countries of production should be much intensified and targeted. Communication with the local communities should be prioritised mainly in Panama where Chiquita hardly has any local advertising. The local communities should be targeted and made aware of the many social and environmental programmes that are being developed and implemented. There are also apparent weaknesses in communication in Guatemala. There needs to be a much greater collaboration in communications with the National Independent Producer Association (APIB) as one way to improve Chiquita’s image in Guatemala. The company should strive for stability and continuity by building the trust of its stakeholders. It requires a commitment to regularly communicate with the affected stakeholders and highlight the company’s distinctiveness, authenticity, transparency, visibility and consistency (Wicki & van der Kaaij (2007). Effective communications could end the ambiguity surrounding the actual impacts such as of agrochemical use. Collaboration with local stakeholders: The company should consult and collaborate with employees during the early stages of project design and employees should be encouraged to participate throughout the development of the project to ensure buy-in and confidence in the company’s core values such as commitment to transparency. Involving workers leads to innovative solutions that support the sustainability of the company and the region. Improving technological embeddedness: Chiquita should share knowledge and cooperate with local research institutions (such as IDIAP or University in Chiriquí) but also international institutes especially when it comes to Panama disease. Higher technological embeddedness could generate transboundary positive sustainability effects. Local research is necessary to find resistant varieties to lower the use of agrochemicals and their impact on the environment. Collaboration with unions and competitors: Acknowledging the powerful influence that SITRAIBANA has over its members in Changuinola, Chiquita should collaborate with the workers union to raise employee interest in training, education and nutrition. Furthermore, Chiquita could improve its embeddedness by cooperating with its competitors including COOBANA, Dole, and Del Monte to find innovative solutions for diseases and mitigate climate change in the region. Industry collaboration is especially urgent in the case of Panama disease, which has the potential not only to devastate a whole industry but deprive large segments of the population of their economic basis. Abbott, R. (2009). “A Socio-Economic History of the International Banana Trade.” European University Institute, Robert Schuman Centre for Advanced Studies (RSCAS) Working Paper No. 22. [Online]. [Accessed 9 July 2017]. Available from: http://cadmus.eui.eu/handle/1814/11486. Aerni, P. (2009). “What is Sustainable Agriculture? Empirical Evidence of Diverging Views in Switzerland and New Zealand.” Ecological Economics 68(6): 1872-82. BananaLink, 2017. “Chiquita Brands International, USA.” [Online]. [Accessed 26 September 2017]. Available from: http://www.bananalink.org.uk/chiquita-brands-international-usa. BASIC (2014). “Analysis of German Banana Value Chains and Impacts on Small Farmers and Workers.” June, Germany. [Online]. [Accessed 9 July 2017]. Available from: http://lebasic.com/wp-content/uploads/2015/11/BASIC_German-Banana-Value-Chain-Study_Final.pdf. BASIC (2015). “Banana Value Chains in Europe and the Consequences of Unfair Trading Practices.” October. Germany. [Online]. [Accessed 9 July 2017]. Available from: http://www.makefruitfair.org/wp-content/uploads/2015/11/banana_value_chain_research_FINAL_WEB.pdf. Baur, D., Rochat-Monnier, D., and G. Palazzo (2015). “The Corporate Social Responsibility of Chiquita.” Fondation Guilé. [Online]. [Accessed 9 July 2017]. Available from: http://www.guile.org/wp-content/uploads/2015/06/Book-Interactif_300dpi.pdf. Chiquita Brands International (2002) Sustaining Progress: Chiquita Brands International, Inc. 2002 Corporate Responsibility Report. Available from: http://globaldocuments.morningstar.com/documentlibrary/document/97c509543c4cd9eb.msdoc/original. Chiquita Brands International Inc. (2000). “Corporate Responsibility Report 2000.” [Online]. [Accessed 9 July 2017]. Available from: http://dev.chiquita.com/The-Chiquita-Difference/Reports.aspx. Corbana (2017). [Online]. [Accessed 17 September 2017]. Available from: http://www.corbana.co.cr/categories/english. Ellenbroek, N. (2016). “Can Multinational Companies Generate Positive Sustainability Effects through Local Embeddedness? The Case of Guatemala.” Master Thesis, Agricultural Sciences, ETH Zurich, Switzerland. Extoxnet, (1993). “Cholinesterase Inhibition.” Extension Toxicology Network, A Pesticide Information Project of Cooperative Extension Offices of Cornell University, Michigan State University, Oregon State University, and University of California at Davis. [Online]. [Accessed 26 September 2017]. Available from: http://pmep.cce.cornell.edu/profiles/extoxnet/TIB/cholinesterase.html. FAO (2014). “The Changing Role of Multinational Companies in the Global Banana Trade.” Intergovernmental Group on Bananas and Tropical Fruits. Rome. [Online]. [Accessed 9 July 2017]. Available from: http://www.fao.org/docrep/019/i3746e/i3746e.pdf. Gonzalez-Perez, M.-A., and T. McDonough (2006). “Chiquita Brands and the Banana Business: Brands and Labour Relations Transformations.” CISC Working Paper No. 23. [Online]. [Accessed 9 July 2017]. Available from: https://aran.library.nuigalway.ie/bitstream/handle/10379/2542/CISCWP23.pdf?sequence=1&isAllowed=y. Haig, M. (2003). Brand Failures: The Truth about the 100 Biggest Branding Mistakes of All Time. Kogan Page Limited, London and Philadelphia. Hunkeler, J. (2016). “Sustainability Assessment of Local Embeddedness: The Case of Chiquita in Costa Rica.” Master Thesis, Agricultural Sciences, ETH Zurich, Switzerland. IDD-Lat (Índice de Desarrollo Democrático de América Latina), 2015. Informe regional, Montevideo. Jaksch, George (2017) What does embeddedness mean in the context of corporate sustainability? Policy Panel and Plenary Discussion. CCRS, University of Zurich, 19 January 2017. Juma, C. (2011). The New Harvest: Agricultural Innovation in Africa. January, Oxford University Press, New York. Lassoudière, A. (2010). L’histoire Du Bananier. Editeur: Quae, Versailles. livinginpanama.com: Del Monte is coming to Puerto Armuelles. April 26 (2017). [Online]. [Accessed 25 September 2017]. Available from: http://www.livinginpanama.com/puerto-armuelles/del-monte-closer/#sthash.fhIpgr6Y.dpbs. maximumyield.com (2017). “Nematicide.” [Online]. [Accessed 26 September 2017]. Available from: https://www.maximumyield.com/definition/2791/nematicide. Matthews, B. A., Kordonski, W. M., and Shimoff, E. (1983). “Temptation and the maintenance of trust: Effects of bilateral punishment capability.” Journal of Conflict Resolution, 27(2), 255-277. http://dx.doi.org/10.1177/0022002783027002003. Riisgaard, L. (2004). “The IUF/COLSIBA – CHIQUITA Framework Agreement: A Case Study.” International Labour Office, Working Paper No. 94, Geneva. [Online]. [Accessed 9 July 2017]. Available from: http://www.oit.org/wcmsp5/groups/public/---ed_emp/---emp_ent/---multi/documents/publication/wcms_101049.pdf. Rossi, D. (2013). “Los Agroquímicos Usados En Las Plantaciones Bananeras Y Sus Efectos En El Agua, La Gente, Y El Ambiente En La Comunidad de Changuinola, Bocas Del Toro, Panamá.” Independent Study Project (ISP) Collection, 1595, Lehigh University. [Online]. [Accessed 9 July 2017]. Available from: http://digitalcollections.sit.edu/isp_collection/1595. Soldati, V. (2016). “Positive Externalities Resulting from the Embeddedness of Chiquita? The case of Panama.” Master Thesis, Agricultural Sciences, ETH Zurich, Switzerland. UN Comtrade (2014): UN Comtrade Database. Available at: http://comtrade.un.org/ [Accessed December 28, 2015]. Wicki, S., and J. van der Kaaij. (2007). “Is It True Love Between the Octopus and the Frog? How to Avoid the Authenticity Gap.” Corporate Reputation Review 10 (4): 312–18. Koster, F. (2005) For The Time Being: Accounting for inconclusive findings concerning the effects of temporary employment relationships on solidary behavior of employees. Rijksuniversiteit Groningen. The report draws on the Master Thesis by Veronica Soldati (2016), Johannes Hunkeler, Costa Rica study (2016), and Nina Ellenbroek, Guatemala study (2016). Chiquita’s employee homeownership programme helps employees to own a home. In the 1990s, Chiquita rolled out the homeownership programme in Honduras, Guatemala and Costa Rica to enable its employees to become independent homeowners. The programme is a sharp deviation from its earlier policy of providing free housing to workers. Puerto Armuelles is located on Panama’s Pacific coast in western Chiriquí Province next to Costa Rica. GLOBALG.A.P. is a farm assurance programme, translating consumer requirements into Good Agricultural Practice. SA8000 is an auditable certification standard that encourages organisations to develop, maintain, and apply socially acceptable practices in the workplace. It was developed in 1997 by Social Accountability International. The range share is based on averages from various sources (BASIC 2014; BASIC 2015; Baur et al. 2015). In fall of 2016, Migros replaced Chiquita bananas with bananas from a pilot project with the NGO WWF in Colombia and Ecuador. The Corporación Bananera Nacional (Corbana) is a parastatal organisation that links Costa Rica’s private independent banana producers and the multinational banana companies. Besides serving banana producers, Corbana develops research programmes aimed at strengthening the quality of banana farming, provides state-of-the-art technology to producers, maintains lines of credit to facilitate the operation and recovery of the plantations struck by natural disasters, among other commitments to improve the industry (Corbana 2017). SITRAIBANA is Chiquita’s workers union in Changuinola (Sindicato de Trabajadores de la Industria del Banano y Agropecuaria y Empresas Afines). Cholinesterase is an enzyme which is crucial for neurotransmission. While the effects of cholinesterase-inhibiting products are intended for insect pests, these chemicals can also be poisonous to humans in some situations. The presence of cholinesterase-inhibiting chemicals prevents the breakdown of acetylcholine. Acetylcholine can then build up, causing a “jam” in the nervous system. Thus, when a person receives a high exposure to cholinesterase-inhibiting compounds, the body is unable to break down the acetylcholine (Extoxnet 1993). Nematodes are parasitic worms that live in the soil and water. They are microscopic in size, and can cause major damage when they feed on plant tissues and roots. There are several different nematicides that are used to control nematodes and prevent plants from experiencing stunted growth. Most nematicides are broad-spectrum pesticides that have a high volatility (maximumyield.com 2017). COOSEMUPAR is the cooperative of banana producers in Puerto Armuelles (Cooperativa de Servicios Múltiples de Puerto Armuelles). Similarly, until 1984, the Costa Rican region of Golfito was the centre of banana production in the country. The company’s departure from Golfito resulted in a collapse of the region’s economy and fuelled widespread poverty and hunger. Although the government of Costa Rica established a “Zona Franca” (a tax-free shopping zone) to relieve the economic hardships, Golfito has yet to recover fully. Temporal embeddedness refers to the past and future of the ongoing relationship between two actors (Koster 2005). For some transactions, uncertainty is high and a lot of trust is required. A mutual future (through for example long-term offtake contracts) can establish trust (Axelrod 1984). A larger probability of future business dealings makes opportunistic behavior less attractive because the punishment ensuing from uncooperative behavior will last longer (Matthews et al. 1983). Black Sigatoka is a fungus (Mycosphaerella fijiensis) that causes a premature ripening of the banana bunches. Mature bananas can then not be exported since they would not survive the journey to the retailers. At the moment, the only way to control the fungus is through aerial fumigation, a practice that started in the 1960s.